SANTA FE, N.M. — In what might be called the Coeur d’Alene effect, Western painting, much of it contemporary or nearly so, has reshaped the art market in the Mountain States, from Arizona and New Mexico north to Canada. 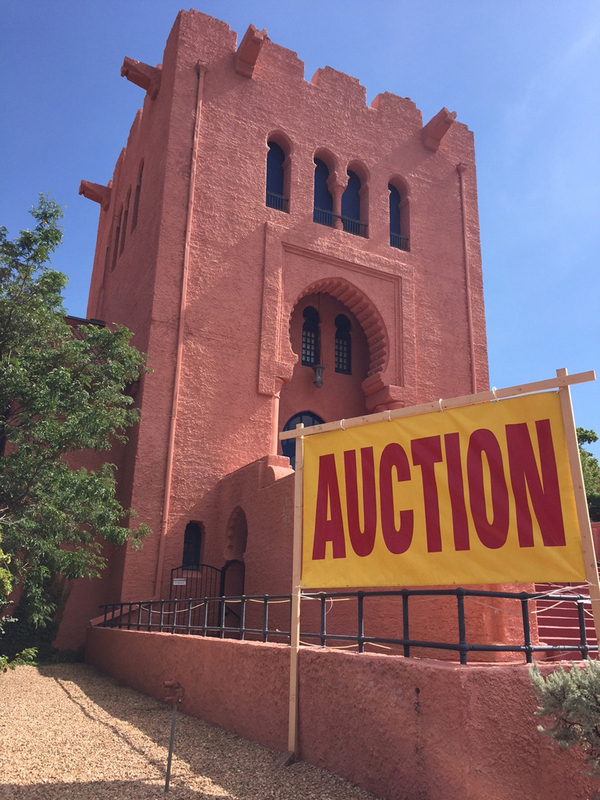 One of the first auctioneers to test the waters in Santa Fe nearly three decades ago, Allard Auctions of Saint Ignatius, Mont., returns annually to the trading town. Resisting the trend to the contemporary, the company instead offers what has traditionally sold well here: antique American Indian art. Treasure or eyesore? 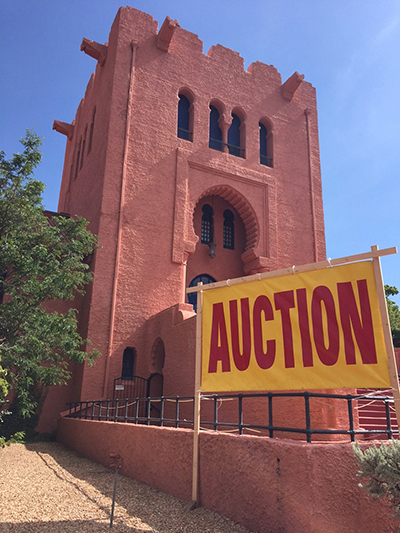 Santa Fe’s Scottish Rite Temple was on the market for $6.9 million when local Masons voted in October 2014 to retain the property. The flamboyant pink structure dates to 1912, before Santa Fe’s now ubiquitous Pueblo Revival style had taken hold. Working in a Moorish Revival style more common to southern California, the Los Angeles architects Hunt and Burns loosely patterned their design after Spain’s Alhambra. In advance of the August 22–23 Indian Market, Allard pleased market-week shoppers with an 800-lot cataloged sale conducted over the weekend of August 15–16. Company president Steve Allard said that the firm’s first auctions were at the La Fonda hotel. Allard has since moved to the historic Scottish Rite Temple. With plenty of parking and seating, along with abundant natural light, the venue seemed ideal for the purpose. “The heyday for Indian jewelry was the 1970s. 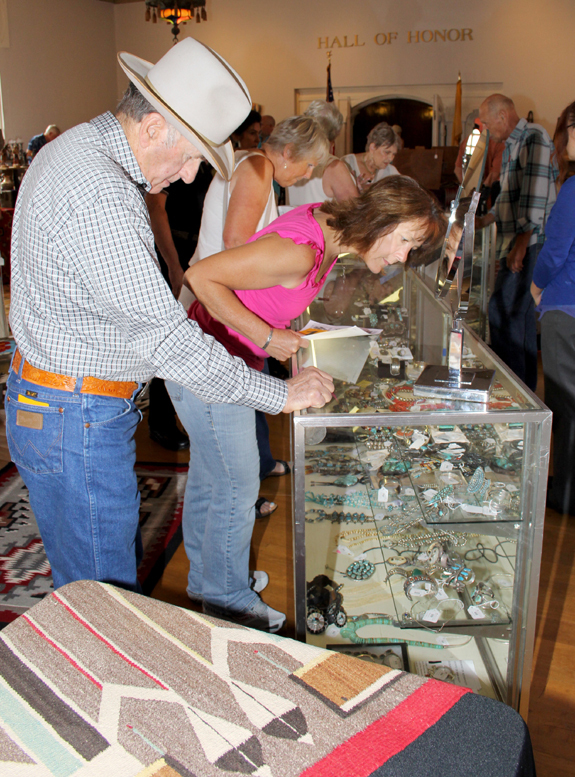 We could buy a concha belt or a squash blossom necklace for $135 wholesale and sell it for $500 to $1,500, easy,” Allard told Antiques and The Arts Weekly. These days, encouraged by the juried Indian Market, which each year awards prizes for the best craftsmanship in all categories, and by such innovations as the local Wheelright Museum’s new Center for the Study of Southwestern Jewelry, many collectors are seeking signed pieces of recent vintage by recognized craftsmen. Bling, Southwest style. 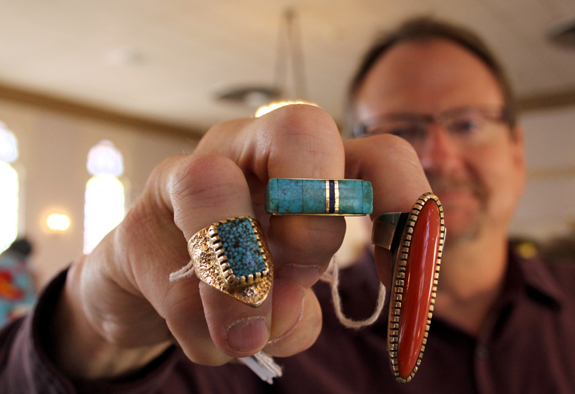 “These will sell themselves,” auctioneer Steve Allard predicted of three gold rings by Hopi jeweler Charles Loloma (1921–1991). Collectively, they achieved $22,200. The trend toward such signed and designed fare has lifted prices for the work of Hopi master Charles Loloma, who died in 1991 and is known both for his work in gold and use of assorted colored stones. “These will sell themselves. They are hard to come by and much sought after now,” Allard accurately predicted of three 1980s Loloma rings that collectively achieved $22,200. Small but select, a single-owner selection of baskets also whetted appetites. Leading the group were tall, narrow vessels by Richard Cultee, a highly regarded Skokomish maker from the Pacific Northwest. The collector traded a 1972 Buick for one of the baskets, sold for $4,200. Another Cultee basket made $7,200. Both have figural decoration. A Salish storage basket left the room at $5,100; a lively Klickitat basket with figures of animals and humans made $4,800; a Luiseño design Mission basket produced a bid of $4,500; and an Apache olla achieved $3,900. 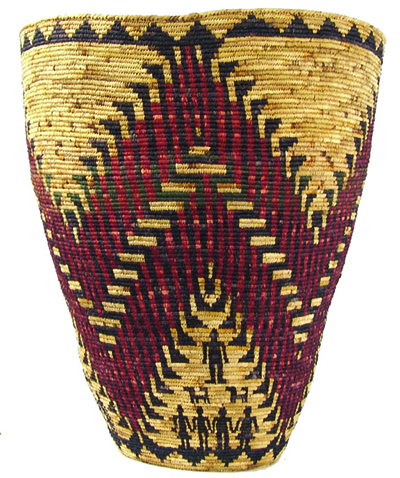 This 22½-by-18½-inch multicolored basket by Skokomish Indian Richard Cultee crossed the block at $7,200. Figures of people, their hands joined, and dogs represent family. Though pottery offerings were few this round, Allard was pleased with two historic pieces: a Hopi Sityatki-style revival jar with an Avanyu border, $5,400, and an Acoma Pueblo McCarty’s polychrome jar, $4,200. A carved blackware pot by Margaret Tafoya of Santa Clara led the ceramics category at $7,200. Assorted Navajo weaving included an early Twentieth Century Germantown textile that garnered $2,280. A pair of Arapaho moccasins, $1,8,00; a complete Shoshone dress ensemble, $1,680; and a Sioux-style beaded horse mask, $2,700, led beadwork sales. “The heyday for Indian jewelry was the 1970s. We could buy a concha belt or a squash blossom necklace for $135 wholesale and sell it for $500 to $1,500, easy,” Steve Allard recalled. These days, many collectors seek signed pieces of recent vintage by recognized craftsmen. Western Americana rounded out the selection. Marked Vanco, a silver-trimmed dress saddle by Van Voorhies-Phinney, circa 1930, was a hit at $5,400. Most intriguing was a circa 1872–1874 Smith & Wesson revolver. A historian of northeastern Montana, where the $1,560 revolver was found, is persuaded by anecdotal account that the gun may have been used by the outlaw Harvey Logan, known as Kid Curry, and his Wild Bunch. 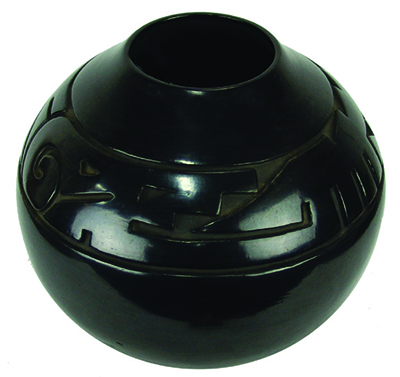 The weekend’s top pot was this signed, mid-Twentieth Century carved black on black storage jar, $7,200, by Margaret Tafoya of Santa Clara Pueblo. It measures 13 by 14 inches. Allard is already gearing up for its next major sale, its Big Fall Phoenix Auction scheduled for November 7–9 in Mesa, Ariz.
“We have great collections of beadwork and baskets,” the auctioneer said. He has not yet posted dates for his March 2016 Phoenix sale or his August 2016 Santa Fe sale. Allard conducts smaller auctions on the West Coast. For additional information, www.allardauctions.com or 406-745-0500.